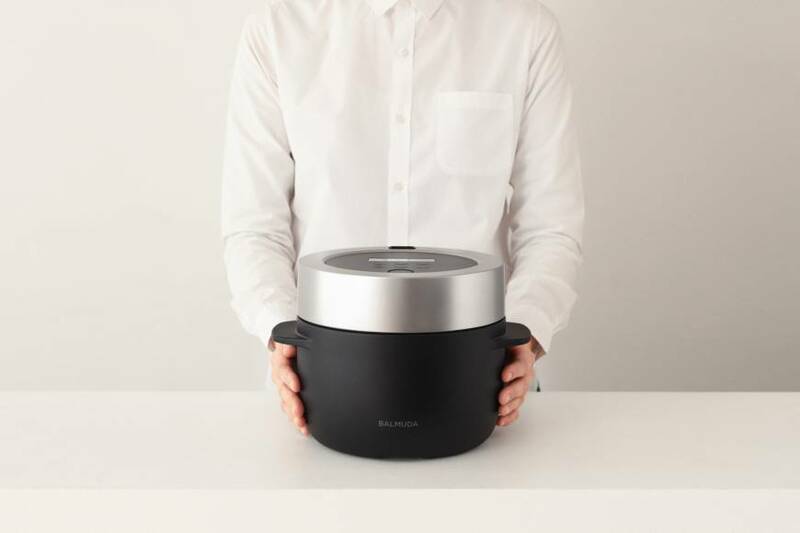 The Balmuda The Gohan rice cooker, introduced earlier this year, has a modern, minimal design that still harkens back to old cast iron pots. | COURTESY OF BALMUDA INC. Cooking rice, the staple grain of the Japanese diet for hundreds of years, used to be a laborious process. A dedicated heavy cast iron or earthenware pot placed on a wood-burning stove called a kamado was used for the purpose, and managing the heat to cook the rice properly required both skill and long experience. The first automated home rice cookers (jidō suihanki) were introduced by Toshiba in 1955, with a Matsushita Electric (currently Panasonic) model following the year after. Rice cookers really took off in the 1960s; most households in Japan were connected to the grid by that time, and the rice cookers themselves became more reliable. Two features that helped them really take off were the timer and the “keep warm” function, which meant that the rice could be set in the cooker the night before, and hot rice would be ready for breakfast. The rice cooker revolutionized 1960s Japanese households every bit as much as the refrigerator, vacuum cleaner, washing machine and television. The next major evolution in rice cooker technology came in the late 1970s, with the introduction of cookers with built-in microcomputers that controlled the temperature changes at a much finer level than was previously possible. The term “fuzzy logic” became a byword in the marketing of these new smart rice cookers. As rice cookers became increasingly convenient and common, some began to yearn for the flavor of kamado-cooked rice. The main feature of rice prepared in the old way is that cooking begins at a heat level that wasn’t possible with older appliances. The introduction of induction-heating cookers in the late 1980s allowed for the kind of high temperatures that a wood-burning stove throws off. Pressurized cookers that emulated the vacuum formed by a hot pot with a tight-fitting lid followed in the 1990s. 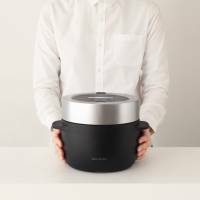 Almost every new innovation in high-end rice cookers since the ’90s has had the aim of trying to replicate the flavor of stove-top-cooked rice, including the use of cast-iron, earthenware and/or charcoal-lined inner pots instead of the lightweight aluminum non-stick coated variety. Some of the new cookers even do away with the keep-warm function entirely, arguing that rice cooked in the “old way” tastes good even when it’s cold. These days, Japanese rice cookers are available in a bewilderingly wide range of prices, and questions abound. Should you get one at all? It depends on how much rice you eat daily and how much time and effort you’re willing to spend cooking it. With a little practice, it’s much easier to cook rice on a modern stove than it was in the olden days on a wood-burning stove or early gas cookers. The heat source is a lot easier to control (some stoves even have special rice-cooking settings) and there are timers to help you measure the cooking times accurately. Good quality heavy cast-iron or earthenware pots are available too, though for a price. But there’s no denying that a rice cooker is a great time-saver. The price you pay for one depends on how fussy you are about your rice, and how much you value the looks of your cooker. For basic rice that’s cooked simply in the manner of the early generations of rice cookers, all you need is an basic unit with a timer that may only set you back a few thousand yen. If you have a microwave oven, you can find little rice-cooking pots designed for it that cost less than ¥1,000. On the other end of the spectrum, meanwhile, are sleek-looking cookers that promise to recreate the kamado rice experience faithfully and without much effort on your part — though they often cost tens of thousands of yen. As for me, I cook rice in a cast-iron pot on the stove when I have the time — but then, I happen to like cooking. I still have a rice cooker for busy days. This is the third in a six-part series exploring traditional and modern equipment connected to Japanese kitchens.